This blogpost represents the contents and discussion of a presentation on the influence of media and networks on the careers of YouTubers. The presentation was held by us at a panel about Work, Entrepreneurship and the Market in DIY Cultures at the Keep It Simple Make It Fast (KISMIF) Conference 2014 in Porto. In the presentation, that was entitled ‘Media-Intermediation & Careers on YouTube: How Musicians get Empowered in Post-Industrial Media-Economies’ we explained, how value on YouTube is being created by generating a common culture within networks of YouTube Artists that call themselves YouTubers and how this common culture and these networks of YouTubers are constituting an intertwined post industrial media economy, where social, cultural and economic forms of value are being exchanged. We also looked at the economic concept of intermediation to understand the difference between ‚traditional‘ music industry modeling and this new form of a post industrial economy on YouTube while at the same time opening up the perspective towards multi channel networks (MCNs). These are commercial companies that contract and empower YouTubers to increase their ability to create networks of culture and their attention to monetize and exploit their works on YouTube. Focusing on these MCNs we developed an idea that we have called ‘media-intermediation’. We showed, how dynamic scopes of action in relation to media platforms are being constituted for YouTubers, their value creation and thus their scope of building of careers on YouTube. This scope, we showed, can be altered for YouTubers by MCNs through services like YouTuber empowerment and and MCNs relations to relevant stakeholders like advertisers, rights holders and YouTube itself. To make our case that culture on YouTube ist networked culture we started our presentation by showing how YouTube stars emerged on this digitally networked medium. With the increasing relevance of these YouTubers, YouTube has become popular in research, e.g. in economics, in sociology and in communication sciences. We, as cultural studies and management scholars showed, how one could deal with this networked value creation of prosumers by analyzing their careers and the role of media and networks within these careers. Regarding the methodology of our ongoing research, we focused on german musicians that organize their activities around YouTube. To the moment of the presentation we have held ten in-depth interviews that we are currently analyzing following a grounded theory approach. We are dealing with the questions of how YouTubers are creating their music culture and their careers and what kinds of roles networks and media play in them. The YouTubers that we have interviewed are no stars though. (Not yet at least). Most of them are middle class artists (Benkler 2012) who have a strong viewership and that court loyal communities and fans. Some are even ordinary people working without commercial interest, besides their jobs and from their homes. Indeed none of the YouTubers that we were talking to were only commercially interested. This is part of explaining why and how YouTubers are – together with other actors – constituting post-industrial media economies. On YouTube as well as in other projects that are related to MuKe (e.g. Engelmann, Grünewald & Heinrich 2012, Winter 2012) we see new media economies as they are constituted on and through media like YouTube as economies of several types of value. These types of value are being exchanged between all participants including YouTubers, fans, communities, advertisers and so on. For cultural types think of knowledge and reputation e.g. JuliensBlog: https://www.youtube.com/user/JuliensBlog, social types include relationships and access to networks while economic types include attention and advertising space. 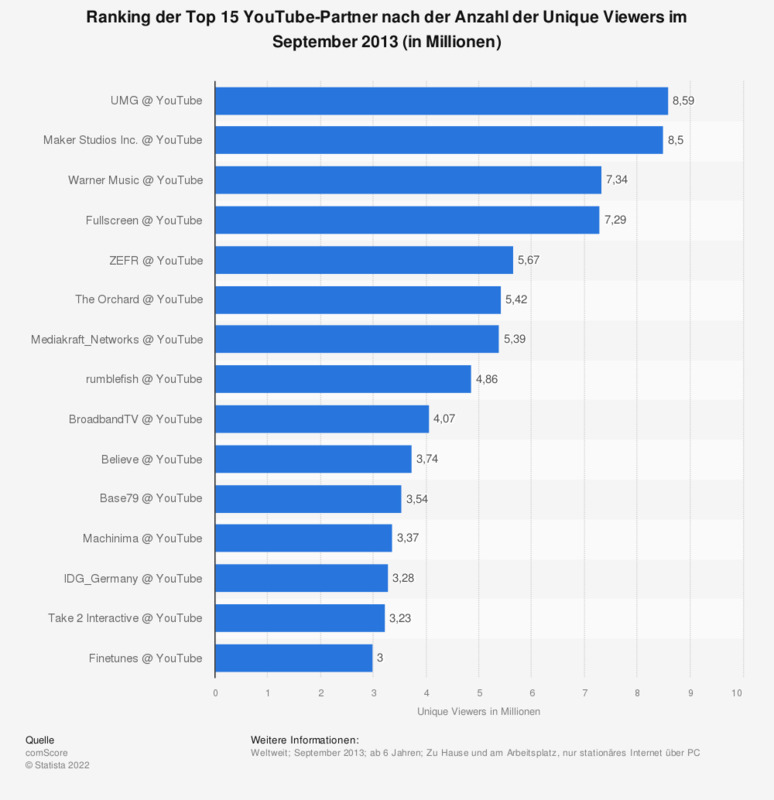 After all YouTube is an attention economy – it is just not only an attention economy! This post-industrial media economy on YouTube is being constituted by what Jean Burgess and Joshua Green called a ‘common culture’ in 2009. They noticed, that what differentiates YouTubers from traditional media outlets who also post content on YouTube, was their ability to create a common practices and forms like audience interaction, vlogging, a certain style of YouTube video and interaction. Traditional media institutions like the BBC or Oprah however just treated YouTube as a ‘channel’ following the logic of pushed culture (Burgess & Green 2009, for push and pull culture see Winter 2012). The post industrial economy that is constituted on YouTube involves cooperation of YouTubers, cultural references between YouTubers, parodies and other types of cultural intertextuality that they call ‘cross-promotion’. From our Interviews we can say, that this is only part of what constitutes economy on YouTube. The cultural dimension of a common culture is backed up by social bonds, friendships and the networks that these YouTubers create and that they build their careers on. In these networks the cultural and the social converges. Here networks are as social as they are semantic networks of meaning. Finally, these networks of common culture increase their scope of maximizing attention which can be monetized through advertisement. Cameos or parodies of popular content or for example YouTubers that reference each other will get more viewers than videos that stand on their own. Through this kind of cross-promotion they are embedding their work into the culture that they constantly create. Drawing from our interviews, we can also state, that the economic dimension is not the last end of cultural and social value creation as there are people participating in these economies without commercial interest or even without the option to monetize their content because the copyright infringing potential of their work. Leaving aside the common culture and the post industrial economy for a moment, we focused the perspective of intermediation. From this economic standpoint we wanted to develop a deeper and more dynamic understanding of media in this post industrial context. Together with the audience, we wanted to understand how careers and value creation on YouTube are being altered. Intermediaries add value to transactions between producer and consumer. For example they aggregate buyer demand or they facilitate the market by matching buyers and sellers (Bailey and Bakos 1997). To continue the story within the realm of music, we showed a chain of intermediaries between artists and fans – an example of how the music industry was being constructed for a long time. (And as it still is for a good part). We showed, how artists, had to be signed by an A&R from a record company. These artists had to produce records with producers from the company and these records had to be pressed, packed and shipped by a distributor to big or small retailers (or to Amazon for what it’s worth). Fans here would only get their record if they would walk to one of these retailers (the market) and purchase it. Their possibility of interaction with the artist itself was basically none as it is intended by markets and money. Today it is clear to most people, that this paradigm has shifted. Today intermediaries seem to be vanishing. Theories of disintermediation state, that intermediaries are being excluded from the relationships between producer and customer, between artist and fan. This has become possible through digitally networked media (so called ‘Social Media’) like YouTube, Bandcamp, Soundcloud and so on. These media services are means of cultural production that change the relations of production and thus economic paradigms (Williams 1977). As they offer new and direct ways to produce, distribute, promote and prosume music, they are treated by most scholars as a space in that artist and fan can meet and directly interact. This is indicated by the blue space in our graphics. However looking at the other actors involved in value creation on YouTube, we have to be critically as there are a lot of YouTube Partners that monetize the content they put on YouTube. We showed, how familiar names like the Universal Music Group and Warner Music are using YouTube for their means. But there are also the before mentioned MCNs, like for example Maker Studios or Mediakraft that made us and our fellow penalists very suspicious about the uncommercial, free culture utopia of YouTube. Now what do MCNs do? First: They are companies with commercial interests. They are assemblies of sometime huge numbers of YouTubers and their channels. These networks of channels are administrated by the company. Administrated means, that they are locked in into YouTubes and Googles Content-ID System with which you can track every video that uses or ones content or parts of ones content and that allows one to monetize or forbid (strike) this content. MCNs also attract and make deals with advertisers that they match with YouTubers from their network. They then get part of the money, that these YouTubers get for the advertisements running on their video. As we have to be suspicious about commercial actors getting involved with YouTubes common culture, we showed, how ones first thought is to assume that MCNs are new intermediaries that try to establish themselves between artists and fans in order to increase their power on that relationship and monetize value created by artists and fans. But that is not all there is to it. Adding media to the perspective of intermediation, our findings suggested something slightly different than classical intermediation. By explaining how to see media not only as an enabling space where artist and fan can meet but as something, that mediates and consequently at the same time enables and limits interactions between the two, we displayed YouTube as an intermediary itself: A media intermediary. Here money, sociality and meaning can flow between artist and fans. YouTube is still a means of cultural production that allows for new possibilities of producing, distributing promotion and prosuming music. After all this is, what made dis-intermediation possible in the first place. 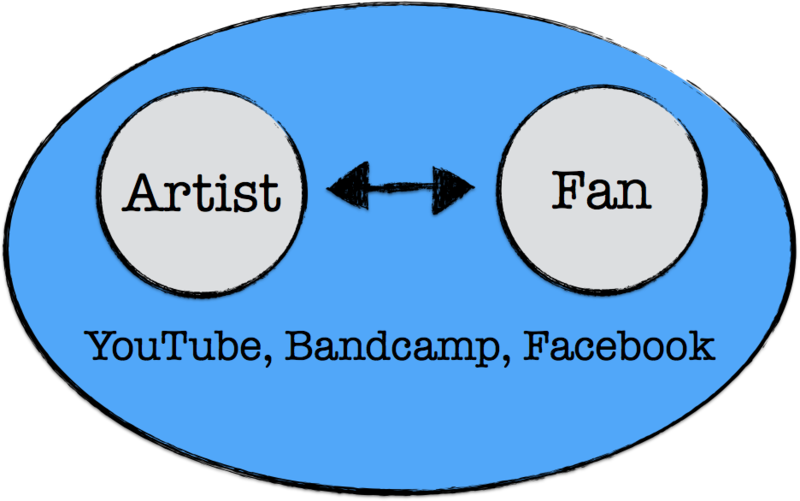 However we showed, that there are different digitally networked media for musicians that offer different services with different and distinct possibilities and impossibilities of value creation between musicians and fans. We thus proposed, that one can think of a certain scope of action that opens up for musicians and fans around a certain medium. This scope empowers musicians and fans to use a medium as a means of production. We showed, how we noticed this scope and its dynamics in a lot of our interviews. For example one musician that we had talked to, told us, that through changes in the functionalities, algorithms and business models of YouTube, their influence on planning and controlling the impact of an video was scaled back by YouTube. The scope of action – which is here shown as a blue ribbon around our medium – was being decreased by changing the medium itself. From our perspective this scope is, where multi channel networks are getting interesting again. Our presentation showed, that for the YouTubers in these networks, the scope of action is being increased. From our interviewees we learned, that MCNs systematically employ cross promotion: Content is being created, referred to, spoofed and parodied throughout the network sometimes even by contracting YouTubers to parody another YouTuber before releasing the original video that will be parodied. YouTubers will thus refer to each other, sending over viewers and attention from one channel to another and by creating cultural links of meaning (and a good laugh oftentimes). MCNs also acquire music licenses for the YouTubers as the maintain relationships with record labels to ease the process of uploading video with copyrighted music. MCNs offer coaching to their YouTubers on how to use video equipment and how increase their scope of using Facebook and other digitally networked media. They even offer access to film studios and video production equipment to their YouTubers helping them to increase the quality of their content. Selected examples from our interviews showed, how a MCN helped in dealing with ‘strikes’ (Videos being taken down by YouTube or a rights holder). The MCNs relationship to YouTube then made it a lot easier to get it back up by reaching some sort of agreement with a major record company. Using another quote, we explained, how videos of certain networked YouTubers will be put on the YouTube homepage exposing it to more monetizable attention. The central point of our presentation thus stated, that there is dynamic scope of action around a digitally networked medium that can be altered. In this case it is altered by the relations with a multi channel network. 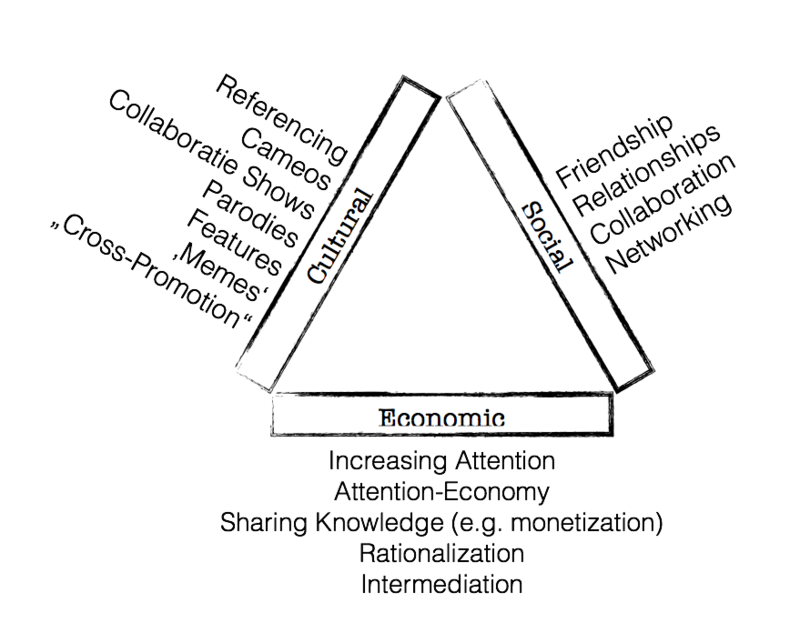 The network opens up the scope for some YouTubers and their social, cultural and economical value creation on YouTube. We proposed, that this is not limited to MCNs as there are certainly other actors and factors that alter the scope but still: This is ongoing research. YouTube and MCNs show, that from an intermediation perspective it seems to make sense to speak of media platforms as media intermediaries and of digitally networked media as intermediation media. Now we have to further analyze the scope that is opened and restrained by these new digital means of production and the actors that are involved in these new post industrial media economies. What’s next? Until now we have just talked you YouTubers. We still have to verify some questions. For example we critically discussed at the panel if we do we have to see MCSs as actors that are not intermediaries but that are sort of ‘floating around the artist and their relationship with the fan’ not a middleman but a networked actor? Or do we have to be more critically and see MCNs as new intermediaries, that are trying to distance fans and artists again? Our next (and already initiated step) is to talk to managers of some of these networks to analyze questions like these. Members from the audience also stated, that we critically have to look at the role of traditional media companies, rights holders and the institution of copyright that also influence the scopes of a medium and the flows of money that are connected to these economies. How much industry lies in post industrial economies? How could copyright be reimagined in the context of a more open and participatory ‘common’ YouTube culture? We are still very interested in feedback and discussion. Not only on conferences such as KISMIF but of course also here on the blog. Feel free to comment, to view the slideshare or contact us. Bailey, J. P., & Bakos, Y. (1997). An Exploratory Study of the Emerging Role of Electronic Intermediaries, 1(3), 7–20. Benkler, Y. (2012). The Penguin and the Leviathan. New York: ACM Press. Burgess, J., & Green, J. (2009). The Entrepreneurial Vlogger: Participatory Culture Beyond the Professional-Amateur Divide. In P. Snickars & P. Vonderau (Eds. ), The YouTube Reader. Mediehistoriskt. Winter, C. (2012). How media prosumers contribute to social innovation in today’ s new networked music culture and economy. International Journal Of Music Business Research, 1(2), 46–73. Media-Intermediation & Careers on YouTube von Lorenz Grünewald ist lizenziert unter einer Creative Commons Namensnennung – Nicht-kommerziell – Weitergabe unter gleichen Bedingungen 4.0 International Lizenz. Über diese Lizenz hinausgehende Erlaubnisse können Sie unter mailto: gruenewald.lorenz@gmail.com erhalten.